Thousands of net-savvy Doctor Who fans have managed to circumvent the first rule of time travel by seeing the first episode of the BBC's new multimillion pound revival of the series before it has even been broadcast. Down the years the Doctor has dealt with Cybermen, Daleks and Silurians with good humour but the BBC's latest incarnation of Doctor Who, starring Christopher Eccleston as the eponymous Doctor and Billie Piper as his assistant, is facing a more troublesome enemy in the shape of internet pirates. The first new episode of the series for 15 years, written by Russell T Davies, has been leaked on to the internet despite being jealously guarded by the BBC ahead of the programme's launch later this month. It is believed to originate from a DVD of the episode sent to a Canadian broadcaster. Tens of thousands of fans have already seen the episode, having downloaded it using a computer program called Bit-Torrent. As a result of the leaks, reviews of the first episode are already starting to appear on the internet. Ain't it Cool News, a US site which delights in reviewing TV shows and movies before they are released, is not impressed. "From the cheap opening credit sequence to the hammy and frequently inaudible dialogue, it feels like a fan-produced parody of the original series," it said. Elsewhere in cyberspace, other fans have successfully campaigned for the episode to be removed from download services. UKNova, which provides downloads of popular shows, said that it had taken the episode down because "it is not in the overall interests of this site to distribute a copy of such a long-awaited and high-profile show before it is aired". Comic: EX—TER-MIN—ATE ALL D—V—D PI—RATES ! ! APA 6th ed. : Gibson, Owen (2005-03-08). Net pirates steal preview of Doctor Who comeback. The Guardian . MLA 7th ed. : Gibson, Owen. 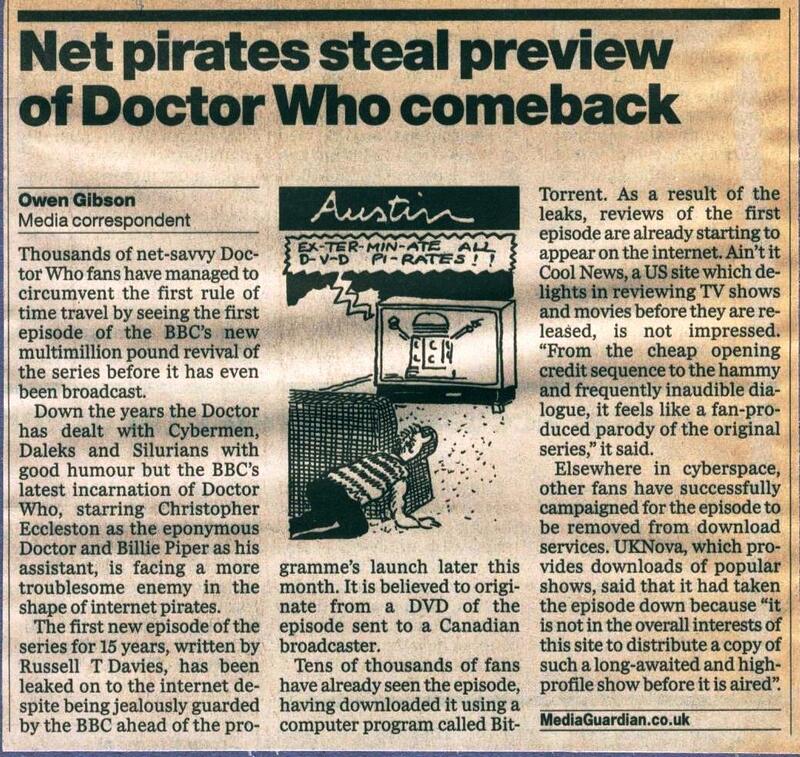 "Net pirates steal preview of Doctor Who comeback." The Guardian [add city] 2005-03-08. Print. Turabian: Gibson, Owen. "Net pirates steal preview of Doctor Who comeback." The Guardian, 2005-03-08, section, edition. This page was last modified on 6 July 2016, at 00:34.